Set five years after Superman II (1981), our caped hero has visited what was left of Krypton, and returns to Earth to battle Lex Luthor and stalk Lois Lane, who now has a child and is engaged to be married. On a budget of $270M there are ample special effects; plot drags somewhat. Newcomer Brandon Routh does indeed look like Superman but is no Christopher Reeve. Our greatest hero 'Returns', receives ovation It is with a degree of hesitation that I reveal a secret about myself: For a good portion of my early childhood, I wanted to become Superman. Everything that I ever wanted to be, and ever wanted to do, I saw symbolized within the character of Superman. The confidence, the courage, the hair; all the qualities that made this character super, I wanted to bring out in me. As you could imagine, when I heard that a new chapter in the Superman saga was being produced, I became as excited as a Star Wars fan getting an autograph from Mark Hamil. With the highest of expectations, I went into the advanced screening of "Superman Returns" expecting the best, and fearing the worst. 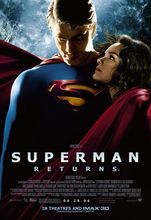 "Superman Returns" begins about 5 years after "Superman 2". Superman has returned from investigating the remains of his homeworld of Krypton, and prepares to start his life as Clark Kent, just where he left off. Unfortunately, things changed while he was away. Lois Lane, now a pulitzer prize winning journalist for her article on why the world doesn't need Superman, is now a single mother, involved in a relationship with Perry White's son Richard. To add to his problems, Superman's nemesis Lex Luthor has gotten out of prison(Superman did not show up for the arraignment), and is planning to build a new continent, using Kryptonian technology found in the crystals of the Fortress of Solitude. With more than enough issues to handle, Superman must also re-enter the hearts and minds of a world that has gotten along without him. To say that my fears were unfounded would be an understatement. This film was, simply put, a triumph. Using aspects from the original movies, Director Bryan Singer(Apt Pupil, X Men 1 and 2), who left production on "X Men: The Last Stand" to work on this project, gives us all an emotional presentation that deserves an award. Adding the familiar qualities that we loved from the originals, with newer(and surprising) plot development, this film utilizes everything from visual to audible storytelling, to become much more than worthy sequel. From the nostalgic opening credits, to the heartwarming dedication to the late Christopher and Diana Reeves, Singers' "Superman Returns" surpasses Christopher Nolan's "Batman Begins", and Sam Raimi's "Spiderman 2" as the most well made superhero film of the past few years. The cast deserves credit as well. Kevin spacey's version of Lex Luthor was so brilliantly delivered, I could only describe as deliciously evil. Kate Bosworth gave a wonderful rendition of the strong willed and hard to woo Lois Lane. And Newcomer Brandon Routh, whose casting raised a few eyebrows, follows in the steps of Christopher Reeves by successfully portraying the shy and nerdy Clark Kent, as well as the brave and wholesome Superman. The pressure to give a convincing performance must have been great for the young actor, because the film would have tanked had Routh not given his all. Hopefully, the pressure was lessened when blessings were given to him from the late wife of the previous Superman, Diana Reeves. With credibility in question and approval taken to heart, Brandon Routh carried the film so well on his shoulders, I would suspect that the young actor was surprised to have brought out such a (pun intended) super performance. When the movie ended and credits rolled, this reviewer experienced a rare occurrence at a public movie theater; applause. The audience had become so emotionally involved, that we all couldn't help but to give an ovation. Whenever you can get a group of complete strangers to applaud a movie screen in unison, you KNOW you have accomplished something spectacular. I left the screening that night with not only a feeling of satisfaction, but a renewed glee in the character that made me believe I could be more than I ever thought possible. Be warned; there will be a feeling of(for lack of a better word) magic going through the air in many of the screenings across the world. So if you are one of the many to view "Superman Returns", don't be surprised when you find yourself clapping and smiling.